Fiesta season is in full swing here in Asturias. August, being the main holiday month, is busy with tourists enjoying the warm summer sunshine and families returning to their village or family homes for a summer break. With lots of people around, there is no better time than August to organise a traditional Asturian market. Porrua is a large village nestled between the coast and the mountains about 15 minutes from La Pasera. It has an old charm about it with many Indiano-style houses built at the turn of the century and quite few new small hotels and holiday homes. Each year Porrua hosts a very popular traditional market. This year like previous years, it was spectacular and well worth a few hours soaking in the atmosphere, watching the street entertainers, admiring the many craft stalls (and resist buying) or sampling the delights of the food and drinks stalls. We arrived early and parked up in a local field that had been given over to parking. As you approach Porrua, you can appreciate its position with a panoramic, green and rocky backdrop. People were already gathering and drinking coffee in one of the very few bars in the village. We wandered though several narrow twisting streets and admired the quaint village houses and barns, some restored whilst others remain untouched and neglected. The market takes place over two days in the centre of the village which boasts a large circular meeting place. With its mature plane trees grafted together forming perfect shade, this communal space in the centre of the village is magical. The craft stalls are sited around the outside whilst the food and drink stalls occupy the shady central part. At events like these I always wonder how the crafts people can make enough money? The stall rent is very expensive and being over two days, with travel and accommodation, the cost of materials and their time, that is a lot of money to re-coup before making a profit. Some people think that hand-made goods are expensive but taking everything into account, they are not. As you enter the market, the atmosphere starts to build, it doesn't take much to imagine yourself in medieval times. Going along to market days with the hustle and bustle of travellers and traders, farmers and locals gathering to barter and trade their goods. All the roads, footpaths and passage ways are strewn with straw and each stall is decked out in hessian, ferns/bracken and other natural products. All the stall holders are in traditional dress and many of the local children also take the opportunity to dress in costume. The craft stalls, many with live demonstrations, were busy setting up when we arrived and setting out their wares which included leather goods, pottery, fibre crafts, jewellery, soaps, musical instruments, book bindings, puppets, miniature sculptures, spoons, models, ironworks and paintings to list a few. As the market came awake, wood smoke from the massive barbecue permeated the morning air and the official opening commenced. A street parade gathered and oxen and carts, giant comedic characters, donkeys, musicians, and a range of street entertainers took up position and made their way merrily through the narrow streets towards the market. The parade is accompanied by dancers and musicians dressed in traditional costume. It is a busy time for these performers as they have many fiestas to attend. The women wear heavy woollen skirts and handwoven shawls. The pipes here in Asturias are a type of bag pipe called the Gaita and played by a Gaitero. You can hear some of the music in the video below. Throughout the day, the street entertainers perform much to the delight of the growing crowds. The smell of roasted costillas (ribs) and chorizo coming from the gigantic barbecue trigger people's appetite and the food stalls begin to feed the masses as children ride around the atrium on the backs of donkeys and on carts pulled by oxen. Visiting Porrua will be an annual pilgrimage for us. It is such a wonderful way to pass a few hours, with time to sit and watch the world go by and appreciate its magical atmosphere. Its gentle rhythm, its constant hum and its colourful spectacle occasionally punctuated by dancers, musicians, jugglers and characters. 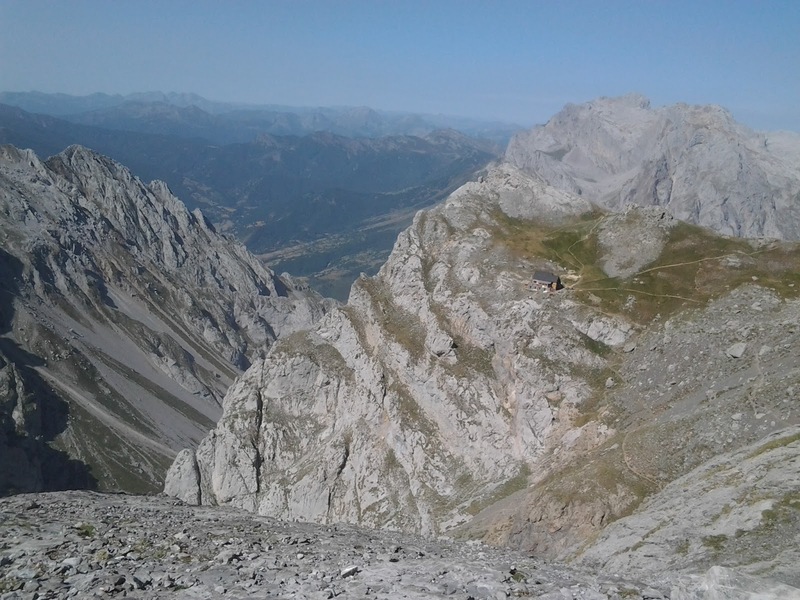 I recently did this circular walk within the Picos National Park that let me discover the beauty and drama within the heart of the central massifs also known as "The Urrieles". It was a walk my friend Nigel Burch invited me to do with Jeseba Uriarte, one of his walking friends, both of them are very experienced walkers and excellent guides. To do this type of walking within the National Park, you need either a good guide or possess good navigation and map reading skill as the paths are not always signed posted and very often follow animal tracks especially when you start climbing one of the many peaks. After a very early start and a 1.5 hours drive from La Pasera to the car park at the cable car of Fuente De, we started the walk that would take us up the Llambrion Peak, classified as "difficult" or grade 3, according to the international climbing scale grading. This route is a 10 hour walk covering a distance of 25 km with a 2371 m cumulative ascent. Collado Jermoso is considered to be one of the most beautiful areas within the National Park and after a long trek I was able to appreciate the area does certainly do justice to its reputation. The views are simply magnificent and if you decide to spend the night at the mountain refuge, you may be able to enjoy the glory of a sun setting across the distant peaks. 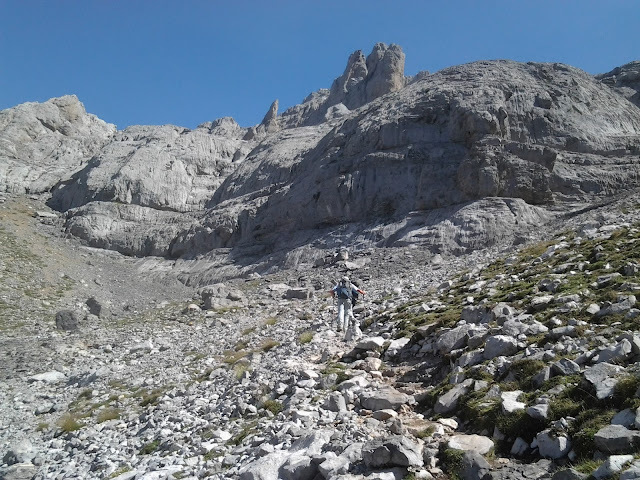 Doing this particular walk was a very enjoyable experience not only because of the impressive scenery I came across but also because from a technical point of view, climbing to the top of the Llambrion peak was the hardest climb I have done so far. The strong winds subsided for us to be able to reach the top and we didn't need to resort to the use of the ropes. We did need to use helmets to prevent any loose rocks falling on our heads. One of the joys of doing this type of walking is the magnificent views you get on a clear day while you are on top of the second highest peak in the National Park and on this particular walk, the sound of the wind blowing through the mountains was something I will never forget together with the sense of achievement after conquering this peak. My heart still rises thinking about it! 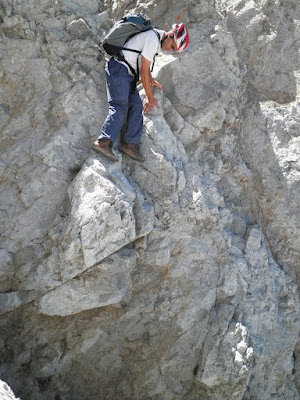 There are obvious safety considerations to take while doing this type of hike and climb other than carrying enough water as there are very few sources of water in the mountains during the Summer in spite of the few remaining snow covered areas; you also need to consider sun protection as the heat is relentless in the midday sun. Hot and dry - saving water. August has been hot, well hotter than usual for Asturias. We had little rain in spring and only a few days of rain in early summer so things are suffering a bit. Large cracks are opening up in the grassed areas, the leaves on the trees are turning yellow, fruit is falling and vegetables are running to seed early. We are watering the vegetables more than normal but not the garden, it'll survive in it's own way. We are finding jobs like weeding are impossible due to the baked earth and if you try you leave the roots well and truly buried and end up just snapping the leaves of. Many plants are drying early despite the heavy morning dew. The weather has been great for tourism but generally the numbers are down but not unexpected I suppose given the economy and risk of further austerity cuts. We are walking earlier in the day and keeping shutters closed as the sun navigates it's way from east to west. This week daytime temperatures have been hitting 34 degrees and dropping to no lower than 14 degrees at night. Our mean summer day-time temperature is usually around 25 degrees. We try and save water where possible and always have a large container handy to take grey water from the kitchen and studio. This is usually taken to the bog garden and used to water the Gunnera which is about 5 times the size it was when first planted. With its meter wide leaves and spectacular flowers, the Gunnera forms the focal point of the bog garden which is a haven for frogs, toads and lizards, keeping it damp ensures our slug eaters are well looked after. Looking back this has been the driest year since we have been here. We are making the most of the days when the heat is too much and when the muggy nights border on uncomfortable. At least we don't have wild fires in this part of the country at the moment and water isn't in short supply so we can't really complain. We have just nearly finished building another fountain (as outdoor taps are called here) half-way down the garden as our current out door tap is situated at the front wall of the garden. Further down the garden we have two large water butts that catch rain water from the shed - it's surprising how much we can collect this way. We hope to add to this method soon with further butts or tanks collecting water from the studio and garage roof. The cats Wentworth and Gawber are also suffering with the heat and prefer to sleep in shade most of the day and venture out at night when it's cooler. The warmer weather triggers shedding of their downy inner coat so regular grooming helps to keep them cooler and gives us an opportunity to check for ticks and fleas. We treat them every four weeks during summer with Frontline Combo as a preventative measure and also Drontal throughout the year, for intestinal worms. It is getting cooler as I type and clouds are gathering so it looks like the rain will return in the very near future. That is why Asturias is usually so green and lush, we enjoy a higher humidity and rainfall than the rest of Spain and are rewarded with beautiful verdant landscapes. All at La Pasera will welcome the rain when it eventually arrives. Summer is well and truly making its mark on La Pasera. It is generally too hot to walk during the day so we have started going down to the local beach early in the morning before the heat of the day. On our return we harvest what needs to be harvested and put crops that need to dry out on the terrace to dry further. The earth is very dry, cracks are appearing in the clay soil and the grass is growing slowly and patchy in places. We have had spells of rain but much less than usual and it is beginning to show. Despite the dry weather, most of our vegetable and soft fruit crops are growing well and in some cases, producing bumper crops. I think the warm damp spring gave the crops a great start. It is a busy time of the year with many of the crops requiring harvesting and processing. The onions were harvested a few weeks ago and have been drying in the store room before being plaited and hung in the loft. With a bit of luck and regular aeration, they will last us until next year. The potatoes are now dry and stored in crates covered with cotton cloth to exclude the light. We have so many cucumbers and marrows we have been distributing them amongst neighbours and friends, eating as many as possible and processing the rest into Marrow soup or juicing the cucumber for refreshing drinks. The beetroot are cropping well and as one sowing is used up, another later sowing is beginning to produce young sweet beets that we intend to bottle or eat. Other root crops are growing well and this year we have our first harvest of carrots - only possible since we added sandy top soil. Also, we have swede, celeriac, turnip and parsnips which will be harvested later in the year. We have begun to harvest our first aubergines, peppers and chilli peppers, so far we are eating what we pick but they will soon outgrow our immediate needs and we will have to think about how we will store them... Maybe bottle the peppers and use some to make pickles and chutneys. This morning we picked a generous basket of tomatoes. Overall they have been disappointing but we expected they would be as our climate is unsuitable for prolific fruiting. We are too close to the sea and salty sea mists soon destroy the young flowers before setting fruit even though we protect them in a plastic tunnel. The beans have grown very well indeed but as they come around the same time as so many other crops we tend not to eat many fresh. We leave them on the plant until the pods dry and then harvest and dry further until thy are ready to shell. This usually gives us around 6 kilos of dried beans for use later in the year. The fennel has been splendid this year and we have eaten many in salads, stir-fries and juiced. If you cut the fennel off and leave the roots in the ground, it will re-sprout and give you a few more smaller fennel for later on in the season. Elsewhere the brassicas, leeks and salad leaves are continuing to grow well despite the dry weather, watered regularly using water stored in butts from around the garden. Well that's all from La Pasera for now, I must get out and harvest the blackberries as one of our varieties is full of fruit and if we don't pick them, the birds or mice probably will. Summer in Asturias is a funny old affair. The weather is usually mixed with intense heat, storms, cool overcast days, misty drizzle and hot muggy nights when the winds carry fine particles of sand from turbulent storms in Africa. Generally speaking, it is never too hot for long, too wet or too cool but remains unpredictable. The weather of course affects our vegetable and fruit crops but apart from the orchard trees being sparse of fruit, most things seem to be cropping well. We look like we will have a bumper harvest of blackberries but the raspberries are failing and probably need renovating in Autumn. The highlights at this time of the year in the vegetable garden are many but fennel, beetroot, lettuce, cucumber and marrow are performing exceptionally well giving us enough for cooking, preserving and juicing. Peppers, carrots, aubergines, squash, beans, tomatoes, celery, celeriac, turnip and a range of brassicas are growing well and we hope will provide enough stock to fill the dehydrator, freezer and larder. Elsewhere at La Pasera we are busy preparing for the rastrillo (street market) next week where we demonstrate chair cane weaving and take a few completed chairs to sell. It is usually a great day with all the money collected from stall holders who pay for space, going to medicine without frontiers. Luis' sister will join us again this year to sell her hand-crafted felt accessories. Luis' mosaic making goes from strength top strength with a steady stream of enquiries and orders. He has just been asked to design and make a garden mosaic for a family in Madrid who found his work from the Internet so he is really pleased about that. Summer is always a busier time with plenty of work to be done in the garden with the long list of maintenance and building jobs never seeming to get any less. We have laid more mosaic paths, finished damp-proofing the studio, started building a fountain to accommodate a water supply for the garden and we are making headway with sorting out the herb garden. Not having television gives us a bit more time to enjoy our respective hobbies and interests and this summer saw the launch of a new blog Adventures in Altruism and plans are developing for an exciting new mosaic exhibition. I am writing more and involved in two projects that you will no doubt hear about in time. We are walking regularly, taking too many photographs and trying to keep relatively fit. We have made soap for the first time this year which is great and we continue to make hand-cream with plants from the garden infused in olive oil. The cultural calendar in Asturias is extremely packed as usual this summer with varied events and fiestas taking place every week. 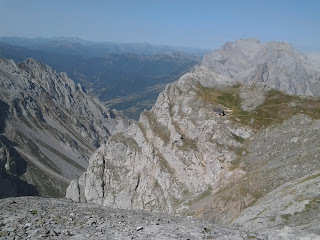 We have just had the Jazz festival which was great, the International Canoe Descent of the River Sella and the local cheese fair takes place this coming week. Lots more to do and see if we get the time. Wentworth and Gawber are keeping well and sleeping most of the day when it is hot and out most of the night enjoying the sights, sounds and smells of the balmy desert night winds. Gawber had a problem with a plaque build-up on his teeth but he let us clean them and with the addition of natural anti-plaque granules in their food, it should no longer be a problem. And finally, thank you to all of you who follow or read our blogs, we really appreciate your feedback, comments and kind words. This blog now has a regular readership of over 2000 people per month from over 100 different countries around the world. Keep in touch, it is lovely to hear from you. Pickled walnuts are not to everyone's taste but if you are a pickle fan, then you'll probably love these. We tend to pickle about 2kg of walnuts each year but could do many more as they are so abundant around here. The key is to pick your walnuts young before the shell is beginning to form. You can test if they are ready by pushing a pin through the green outer skin, if ready, it should go straight in and not hit forming shell. Wash the walnuts, prick with a fork and put in a brine solution for 2 weeks - change the brine after one week. To make the brine dissolve 225g salt in enough water to cover the walnuts. After the two weeks, carefully drain and leave to dry. They will turn black if not already black. This is perfectly normal. Bring the ingredients to the boil and simmer for 15 minutes. Add the walnuts and take of the heat. Leave 15 minutes then decant the walnuts into clean sterilised jars and top up with the pickling vinegar. Seal and label. They will keep for about a year or until consumed. Great in salads, with cheese or savoury dishes.